Newport News Middle Ground – Chesapeake Chapter U.S.L.H.S. 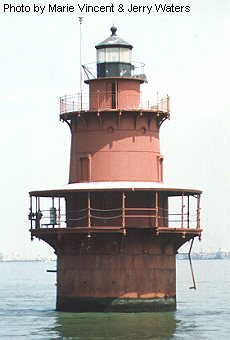 In 1871, the United States government established a light station to mark the underwater L-shaped shoal in the middle of the Hampton Roads shipping lanes. This caisson lighthouse was completed and first lighted in 1891 at a cost of $50,000. The lighthouse was fitted with a fourth-order Fresnel lens. The over all structure is 56 feet tall and has a three story keeper’s quarters. The original fog signal was a bell, which was struck a double blow every 15 seconds by a Stevens machine. In 1954, the signal was changed to one blow every 15 seconds. The current light is on a pole out side the lantern room. The light was automated in 1954 and the two keepers removed. In 1979 a ship hit the lighthouse and caused water to leak into the lower part of the caisson. The lighthouse is located in about 15 feet of water, on the west end of Newport News Middle Ground, Hampton Roads, and Newport News, Virginia. This excerpt below is based on an article in the Hampton Roads Daily Press of July 30, 2003. Two nonprofit groups have submitted applications to own the Newport News Middle Ground Light, the Department of the Interior has announced. Neither group has any prior experience with historic preservation, but at least one group has ties to the lighthouse community. Both seek ownership under the provisions of the National Historic Lighthouse Preservation Act (NHLPA). The applications were revealed July 29, the day after Interior announced that Thimble Shoal Light, the other offshore lighthouse of the Hampton Roads area, will also be made available to new owners under NHLPA. The two organizations are Harbour Credit Counseling Services, a debt management group based in Virginia Beach, and Veterans First, an organization based in Ordinary, Virginia. Preservationists had been worried that no one would apply to maintain and restore the lighthouse, so they were relieved that someone had come forward, though a bit concerned about possible competition between the two groups. The lighthouse is a 52 ft cast iron “sparkplug” tower located adjacent to the main channel of Hampton Roads near the Monitor-Merrimac Bridge-Tunnel (I-664). It is an active lighthouse, and the Hampton Raods Pilots Association considers it an important aid to navigation in the harbor. Nothing is known about the Veterans First application. Harbour Credit Counseling Services is operated by Ray Noftsinger, a member of both the U.S. Lighthouse Society and the American Lighthouse Foundation. Noftsinger is well aware of the challenge his organization faces in assuming responsibility for the lighthouse. The application proposes a three-phase plan for restoring the structure. The first and second phases would be concerned with repairs needed immediately and improvements to safety. Some of the catwalk supports are corroded or missing, Noftsinger noted, ladder rungs are missing, and there is no bumper or mooring facility for boats. Noftsinger said his organization has some seed money to devote to the project, but he hopes to get corporate support and donations to help with the cost. “We’re part of the community and we just want to help,” he said.